What if the musicians are busy with the season? 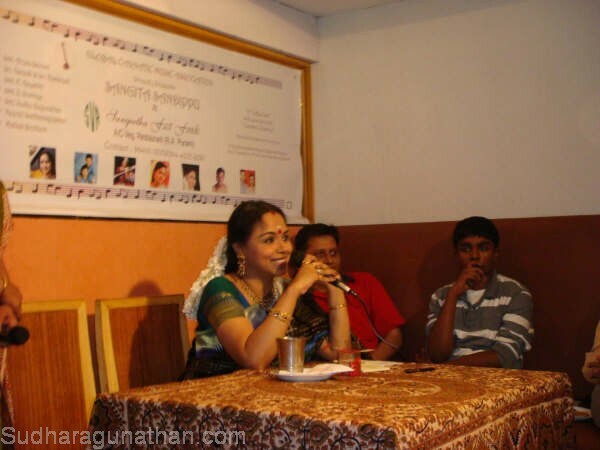 Apart from ‘only singing’ in the plethora of concerts that encompassed the music season, the artistes must also interact with the rasikas, without whom they have no identity or entity…..Thus thought the Global Association for Carnatic Music and decided to organize this session where the audience were face to face with a few leading musicians. Excerpts from the session and the answers will be put up in this site shortly. The question that touched upon her dabbling with the commercials brought about a very enigmatic smile. She knew that it had crossed many a minds, and ensured that her answers were pointed, to put many contemplating minds to rest, never digressing for one moment. Due to paucity of time, the Organizers announced that one last question can be accommodated, and what a question it was…..very relevant, very thought provoking and it did kindle a lot of minds. Music must be made a part of the curriculum in schools – what would Sudha’s contribution be to it?! Watch out for the chat session that will be made available for viewing shortly.